I thought I would share some recent projects i've been working on that feature 3D printing. This is definitely a major frontier in modern sword manufacturing, and while i'm far behind some, I thought folks might be interested in the small projects I've completed. 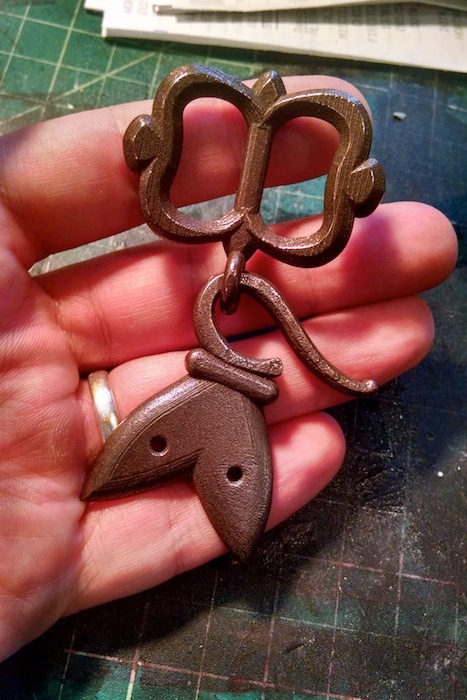 I've been working with Shapeways 3D printing service, which can produce "bronze infused stainless steel" prints from computer models. If you're interested in how that process works, you should read more at the Shapeways site. It's sort of a hybrid of printing and casting. It's currently prohibitively expensive for any substantial volume (like a sword pommel or hilt), but for small items with limited volume, it can produce extremely find details for a functional cost. So far I've incorporated 3D printed parts into only two swords. 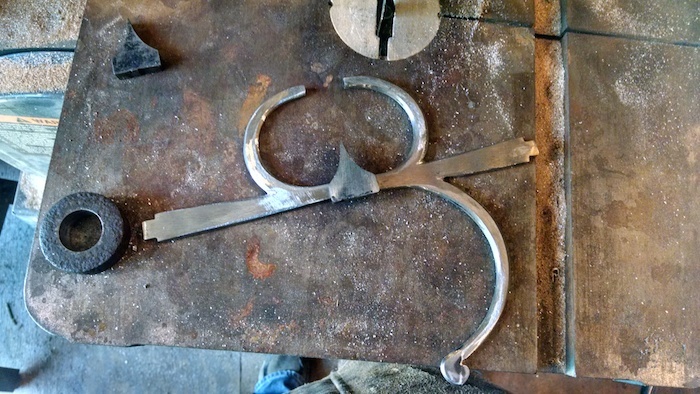 I designed a sort of quillon cap that slots onto the end of a rapier quillon and then soldered in place. You can see pics below of the two rapiers I've done this for so far. The leaf-cup hilt was the original project, where the natural bronzy finish of the printed parts fit quite well. 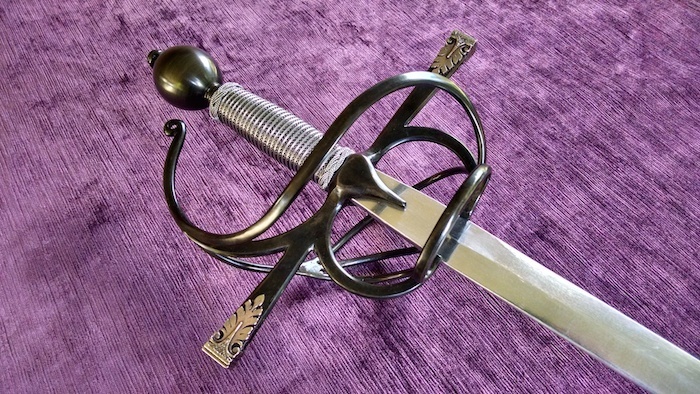 The second rapier with the quillon leaf-tips had a different color scheme, so I plated the prints in brass and then in nickel to match the other silver details. The printed part was designed to fit onto the quillon tip with recess that matched the step down on the quillon. Since the quillon part was plasma cut from a CAD drawing too, getting a good fit wasn't difficult. As delivered the parts didn't quite fit, but the 3D Printed bronze/stainless can be heated with a torch and hot bent. With a little heat and a little hammer tapping, the parts were super snug even without solder. The next time I design parts like this, I'll leave a hole in the quillon tip to allow a spur of quillon to poke through. Then I can hot peen the tip to secure it and not screw with solder at all. Each printed tip costs about $20, but for $40/sword it adds quite a bit of exciting detail. The other project i'm experimenting with 3D printing for is rapier hanger hardware. 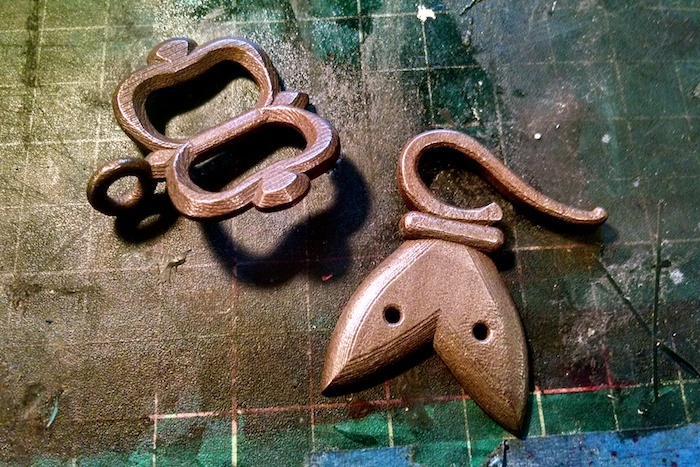 I drew and printed a rapier hanger/buckle pair based on a beautiful set of cast brass parts by MatthiasMetalsmith. These won't be for sale since the hardware design isn't mine, but it was an excellent proof of concept. Again, these components are about $20 a piece, which is steep for a whole set of hanger hardware, but not so far off what cast sets run. Plus the design flexibility is limited only by my terrible 3D modeling skills! You can see the as-delivered version with visible step lines and also the cleaned up shots. When substantially sanded, the 3D printed bronze/stainless steel reveals a much "steelier" color. The bronze is heavily concentrated at the surface of the casting, I think, so there's more bronze color initially. Anyhow, I'm sure there will be more such projects to come. 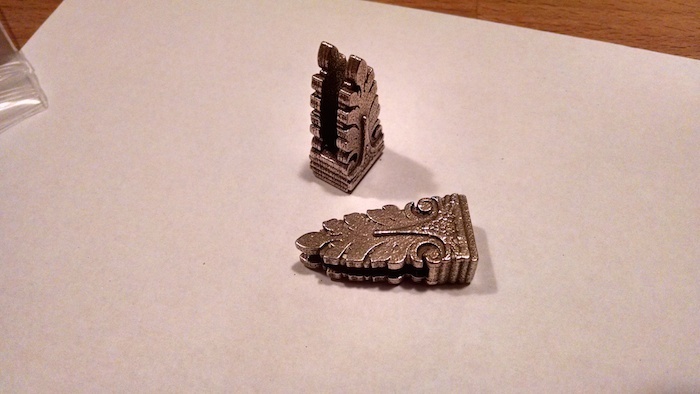 Until printing larger volumes like a sword pommel become viable, small components like this offer a great way for me to add detail to a piece that would otherwise be outside of my capabilities. Really nice work, and frankly if I read that right, 20 for a piece is inexpensive. I love how they look against the blued hilt. This is a great application of this new technique! I wondered for some time: what is the structural integrity for 3D-printed metal objects like? You mention they do "bronze infused stainless steel" and I think I've seen they also print "stainless steel". Is the material comparable to 'normal' stainless steel? 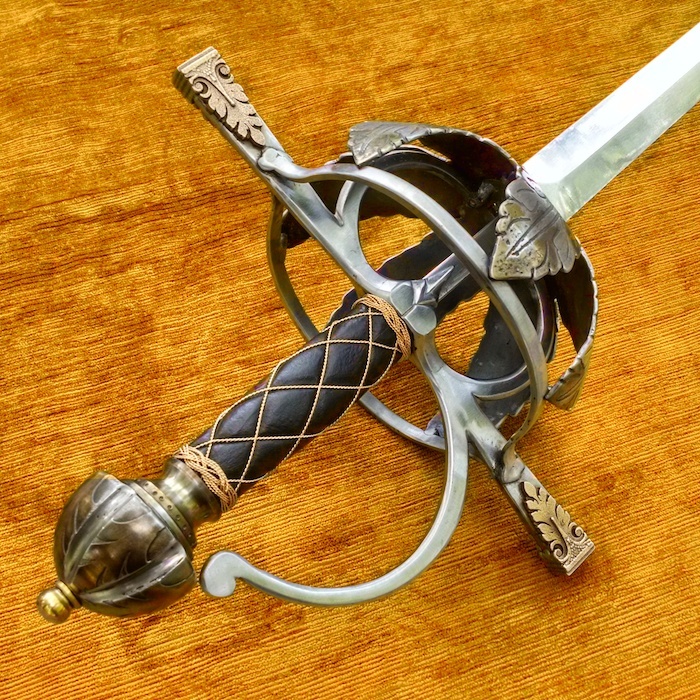 Wording the question differently: if I would, for example, 3D print a sword's blade, would it be comparable in quality to a forged/machined blade? Jasper, I think there are a lot of different kinds of processes and materials out there. Laser Sintering is an industrial process that uses a laser to fuse powdered metal. This as I understand it can make quite strong (and pure) metal forms. Maybe that could be used to create a blade, although its certainly not the easiest way to go about it with existing technology. 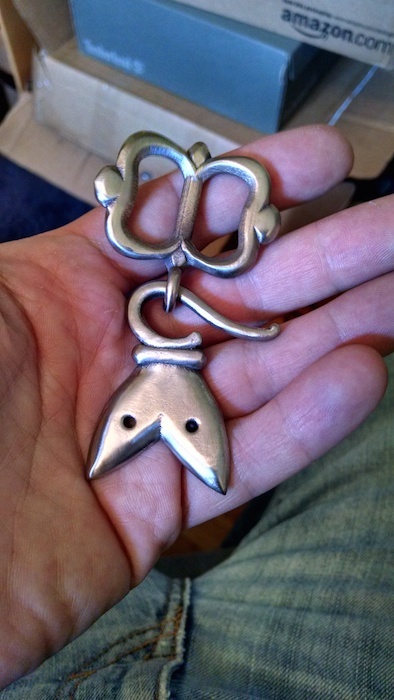 The particular process that Shapeways uses for their Stainless/Bronze is more of a hybrid casting process. Instead of sintering solid stainless steel, they print a sort of hollow matrix of stainless powder fused with adhesives. Then they take that form and pour molten bronze into it, which eliminated the adhesive and fills the voids. So really, the end product is more likely to have the structural properties of bronze with a bit of reinforcement. I can tell you that the printed components can be heated and hot-bent, and also that they are incredibly hard - i.e. only drillable with carbides. They seem to be very sturdy (not brittle). I haven't tried any "annealing" actions, but since stainless and bronze are annealed in opposite ways, that might be tricky.